I can’t say enough good things about Catherynne Valente. After reading Deathless, I’ve been trying to read other books. I’ve been disappointed by most of them, not because they aren’t good, but because no other author is able to live up to Valente’s prose. It’s exponentially phenomenal. “Silently and Very Fast” is no exception. 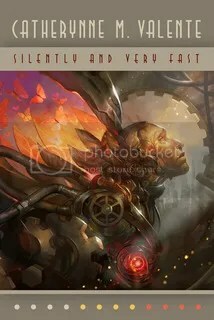 In this Locus award winning novella, Valente tells the story of a robot named Elefsis. Elefsis began as a Smart house interface, but then evolved into a robotic creature with sentience and even feelings. And of course Elefsis usings the word “feelings,” because robots aren’t allowed to have “feelings” like a human being. The brilliance of “Silently and Very Fast” isn’t the story itself. The difference between man and machine has been explored in other works of fiction, but never like this. Elefsis’ journey to consciousness is framed through various fairy tales and memories, and when put together they explore Elefsis’ relationships with her former human masters and mistresses over the course of several generations, and explore the depths of the unique form of non-human thought and perception that Elefsis develops. Elefsis’ mind contains an ever-expanding world known as the Interior which is limited only by imagination. The storytelling in “Silently and Very Fast” is fragmented and non-linear, but poetic and oh so beautiful in every way. Most everyone lived twice in those days. They echoed their own steps. They took one step in the real world and one in their space. They saw double, through eyes and monocle displays. They danced through worlds like veils. No one only ate dinner. They ate dinner and surfed a bronze gravitational surge through a tide of stars. They ate dinner and made love to men and women they would never meet and did not want to. They ate dinner here and ate dinner there–and it was there they chose to taste the food, because in that other place you could eat clouds or unicorn cutlets or your mother’s exact pumpkin pie as it melted on your tongue when you tasted it for the first time. Valente crafts a world of Machine Princesses and monocles, of crystals and Turing tests, of doormice and dreambodies. The world that exists within Elefsis’ mind is filled with great joy and a childlike form of innocence, despite also containing the wisdom and experience of generations. As Elefsis grows, she (he? it? all of the above?) begins to understand the darker history of what’s been going on in the outside world at the same time as she and her owners had been exploring the Interior in their dreambodies. Valente has an irresistible imagination, and as I mentioned with Deathless, her writing makes everything else seem bland and watery by comparison. The vividness of “Silently and Very Fast,” is remarkable, and I’m rooting for it to win a Hugo. It was even more brilliant than I’d expected. If you haven’t read it yet, you should do so immediately. I read this book as part of the Award Winning Books Challenge.